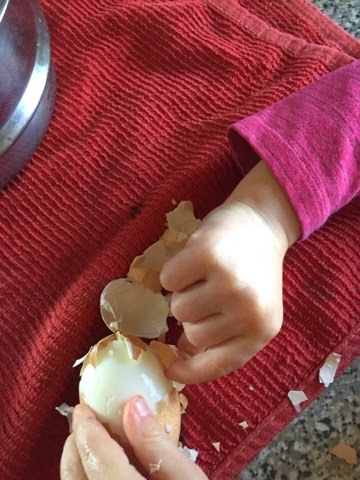 I have been boiling eggs for a long while and have tried ALL the methods –or so I thought– to get eggs to peel easily. I reasoned I had a pretty good handle on this most basic of kitchen cookerys. 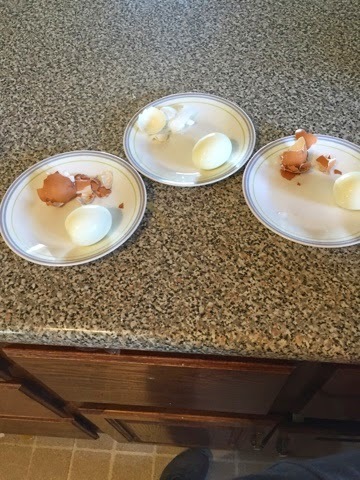 Boiling eggs came up the other day in a group I’m in, prompting much discussion. 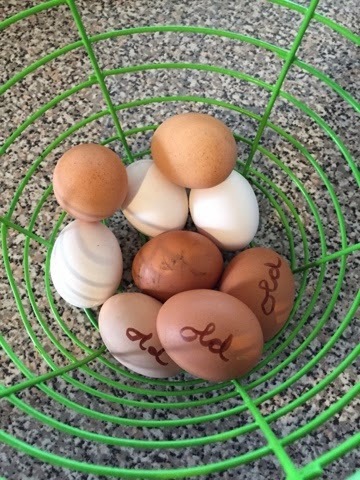 I had thought that adding salt or baking soda to the water worked fairly well, especially for farm fresh eggs like we usually have. I still did spend an inordinate amount of time peeling the little cackle berries though. 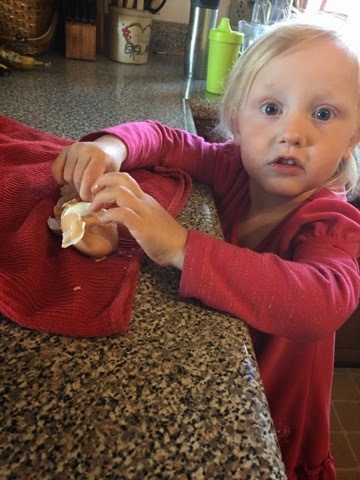 I had tried the pin method too, where you puncture the shell but not the sac around the albumen in order to let the water separate them and make peeling easier. I thought this made the eggs too wet and frankly a little gross. I had also tried the YouTube videos’ wherein they basically blow an egg out of its shell in seconds–which didn’t work at all for me. Then last night my friend Amber changed my life forever. 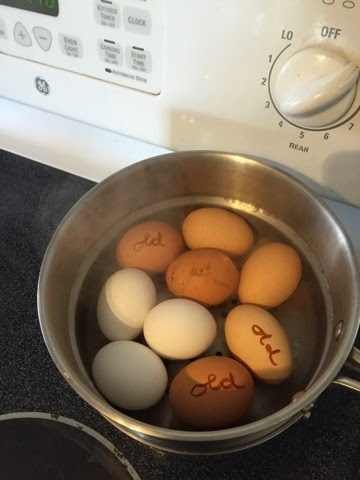 Boiling eggs again came up in conversation. 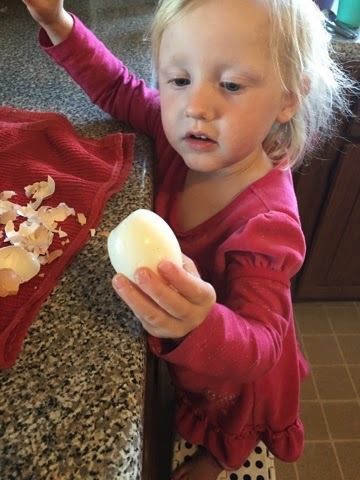 She shared how she just read an article how to boil eggs and was feeling success in the egg peeling arena for the first time in her life. She had pretty much given up until she read the article. It convinced her because told her the science behind the method, so she thought she would try one last try. My experiment included the white store bought eggs of undetermined age we had on hand for Brielle’s activities she came up with when she taught preschool last week, the brown eggs I marked “old” which were at the back of the fridge from a friend’s farm, and then the plain brown eggs we took out of the nesting boxes within the last couple of days. Here is what you do: boil water. 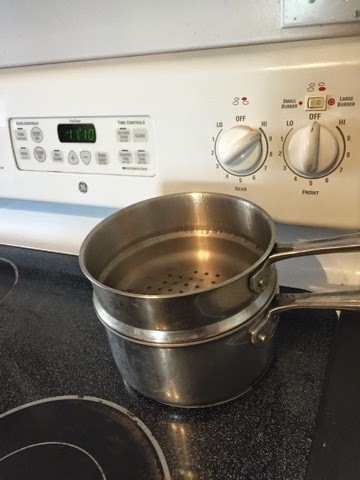 Put your steamer on your pot. Add the eggs to the steamer–only once the water is boiling, mind you. Cover. Set your timer for 12 minutes. Go laugh your head off to a Good Mythical Morning episode. (I guess that part can be optional, but seriously, you should do it.) 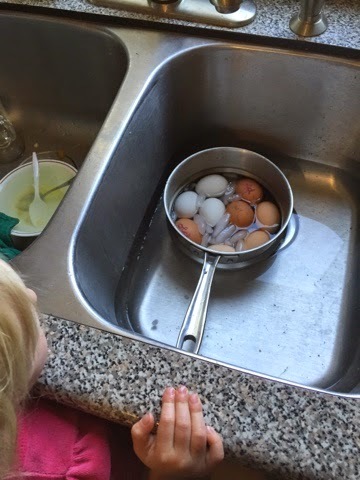 When your timer rings, immerse your eggs in an ice water bath. We didn’t have very much ice but it still worked. 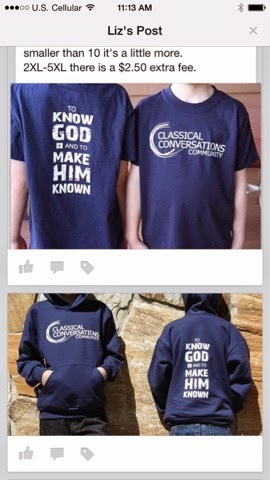 I didn’t time this part, but I first measured my kids’ tee shirts to be sure of their sizes and placed an order for some Classical Conversations shirts. So however long that took is how long they sat in the icy water. Now. This is the amazing part. even the ones that had been under a chicken a day or so ago. Now, go boil and peel happy. I really should not read. It fills my head with all sorts of un-executable ideas and grandiose plans, and frankly, drives my husband nuts. I just LOVE this book: Roots, Shoots, Buckets and Boots . It’s chock full of great ideas for gardening with your children. I love the watercolor illustrations, quotes and poetry. Some of the ideas make me want to go till up the front yard right now to create A Garden of Giants or A Flowery Maze. I want to turn our old whiskey barrel into a water garden. I want to make a sweet little garden in my holey old purple rubber boots filled with parsley, chamomile, Easter Egg radishes and Thumbelina carrots. I can tell you how that will go in real life. I would put dirt in my old boots. Small children would see this and fill their every day boots, and probably Dada’s with dirt. I may or may not get the seeds planted. I would set the boots on the front step to grow. I’d probably forget to water them. Something may sprout. One day some child would see the boots, filled with dirt and half alive seedlings and they would decide to put them on, and have soil filled boots up to their thighs. And then another child would decide a hose was necessary, because, really, the hose is always necessary, and fill the boots with water, in addition to the first child’s legs, and the soil, and the seedlings. Then when they tired of that, they would somehow extricate said legs from the mud boots and come into the house. Probably across the cream carpet. And the beautiful little miniature garden in process would get thrown into the yard and get run over with the mower. Possibly. I could be wrong. I can tell you how gardening went today. I Square Foot Garden. Kevin thinks it’s kind of silly because we have ALL THIS SPACE, and I want to truncate my garden to fit in the sunny spot right under the windmill, next to the clothesline. I do it like this because it’s close to where I am all the time. It’s near the spigot so I can water conveniently. When I had the traditional farm wife garden, out in the middle of the side yard, I never went over there, to weed or water. Let’s just say nothing really grew. Except weeds. I’ve been really happy with my little Square Foot Garden. I don’t grow enough to can or store for the winter, but I’m not really in a stage where I can do that anyway. If I tried to put that kind of pressure on myself, I’d be miserable, and so would my chiddlers. Anyway. It’s the 26th of May, Memorial Day. It rained last night so Kevin took a little time off to help me with the garden. My parents took the older three to a Memorial Day service, so we thought the timing was perfect. The parent-child ratio was 1-1. It doesn’t get a lot better than that over here. I needed to mix more of the “Mel’s Mix”–compost, vermiculite and peat moss–this is supposed to help keep the garden weed free. We had stopped and bought some seedlings yesterday, and I had saved some seeds from last year (we’ll see if they grow…). Kevin helped me find the tools I needed. One of the frustrating things about my life is I can NEVER find anything when I need tools. Kevin just doesn’t have a “spot” for stuff. And even though I DO, the chiddlers don’t, so when they can’t find their tools, they abscond with mine. I’m locking my new ones up. We took off the lattice to mark the squares, raked off the leaves and accumulated debris, raked up the soil that was still there, mixed the “Mel’s Mix” in the wheelbarrow, and applied it to the boxes. Then he filled my new box with field soil. He had read of a way to garden where you just plant your seeds in holes in landscaping fabric, so we’re trying that. (Again with the reading 😉 ) I brought out my seeds, which had been stored in plastic Easter eggs (I read somewhere that it is an easy idea to store them this way), and planted some of them. Sounds simple. Relaxing. Working side by side peacefully with my handsome husband. 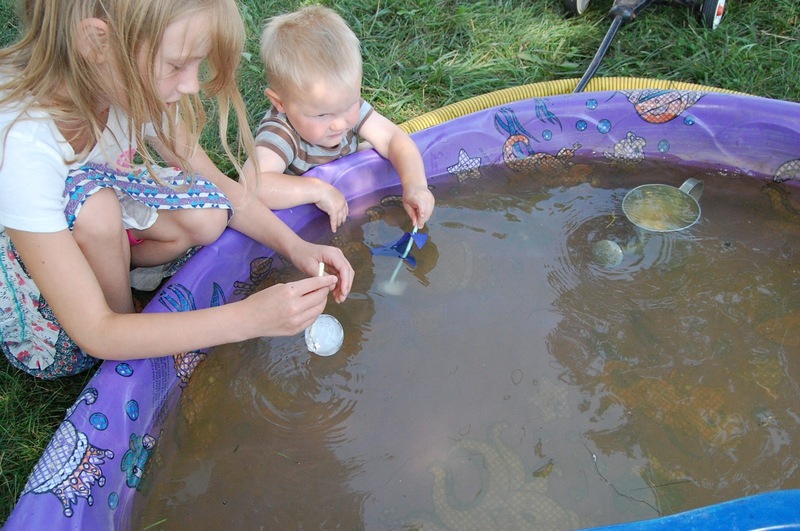 Giving children the joy and wonder of reconnecting with nature? Introducing children to the pleasures of gardening? Cultivating wonder? We don’t have a Costco in our town. We drive over an hour to one, so we don’t go very often. There are seven people in our family. I very much dislike going to the store with small children alone. So when we go, I stock up for the end of the world. It freaks my husband out a bit; buying that much food all at once. He sees the dollars on the receipt; I see that I won’t have to buy ranch dressing until 2015. Aviana wanted to know why, when we have at least 17 grocery stores in our town, do we have to drive over an hour to Costco? I told her it’s because I’m highly illogical. Kevin bought dried mangos at both stores. He really likes them. 75 pounds of flour should last a while, right? We’re going to be doing Unprocessed October again this year, so I plan to be baking a lot. I will confess, I was tempted by the sheepskin rug for $115. I’ve said it before, and I’ll say it again: I have awesome kids. It was LOUD in the Suburban. There was bickering, silliness, excessive use of energy, laughter, giggling, sharing, crying, a diarrhea incident, playfulness, and annoying screaming/singing. Brielle told a story to the boys on the way home that entertained them for a good 15 minutes. Aviana and Brielle wanted to buy some candy with their own money and were occupied with that for nearly the entire time we were in the store. I let Brielle eat an entire quarter pound of malted milk balls (which we now call “melted moth balls”). I’m trying to relax about it. Elivette happily rode on my back in the mei tai and only nursed ONCE, briefly, all day. Denton and Cadrian were thoroughly entertained by samples. I shop in a swirl of commotion. I didn’t buy a single NONfood item. I wanted to, I really wanted to. I’m still thinking about the four pack of wool socks for $12.99. I bought a lot of mushrooms. Kevin wants to know who is going to eat all those mushrooms. He has forgotten the amazing that is the homemade cream of mushroom soup. I seem to have misplaced ten pounds of carrots. Today I am thankful for coffee in a mug that fits just right in my hand. Thankful for the pumpkin spice creamer, the french vanilla creamer, and the peppermint mocha creamer. Thankful for options. Thankful for steaming hot bowls of oatmeal with peanut butter and honey. thankful for the donut hole treat the children enjoy every Sunday. Thankful for McDonald’s dollar menu when we belatedly realize the tummies think it’s noon but we still have errands to run. Thankful for home raised hamburgers with Muenster cheese, that I neither had to make or grill, for fries deep fried in lard from happy pigs, and for fiesta veggies. Thankful for leftover country pineapple casserole and homemade granola “larabars”. Thankful for a six year old souschef and the beer bread we made. I’m thankful for the eight year old who graciously and delightedly entertained the baby (and I daresay was entertained by her) so we could bake. I’m trying to be grateful for the brothers’ whining the entire time because it was an opportunity for me to practice patience, to teach, to address the sin in their hearts. I’m grateful for locally grown yellow fluffy popcorn, that we afford real butter. Thankful for sharp cheddar and pears from our tree and apples from the store. Thankful for the stolen swigs of root beer. ;-). Today was Aviana’s psuedo birthday. We let the kids choose something special to do and what we eat on their birthdays. Aviana wanted to have some cousins over but they weren’t available on Saturday for her actual birthday, hence the psuedo birthday. it worked out for the best anyway since the grandmas have to work on Saturday and it’s the day after Cadrian’s birthday. Two birthdays in a row is a lot harder than I bargained for when Cadrian decided to come a week early. I still want each child to feel special without killing myself in the process. For breakfast, we had French toast made with storebought, white French bread and all the cinnamon sugar and syrup a small child could want. Lunch was super delicious pulled pork made by Grandma and Super sloppy joes made by me. I follow this recipe: We had fresh fruit and veggie trays. For dinner we had friend grown kale with toasted cashews: (only I used almonds) and friend grown sweet corn. Eight years ago today, I had no idea we’d be meeting our sweet baby A six weeks early in a few short days. I couldn’t have imagined how much she’d change my life. For so much the better. I bought the Taste of Home Smoothie and Blender Drinks Recipe Cards cook booklet the other day. I am so glad I did. We have already made several recipes from it and they have all been terrific. 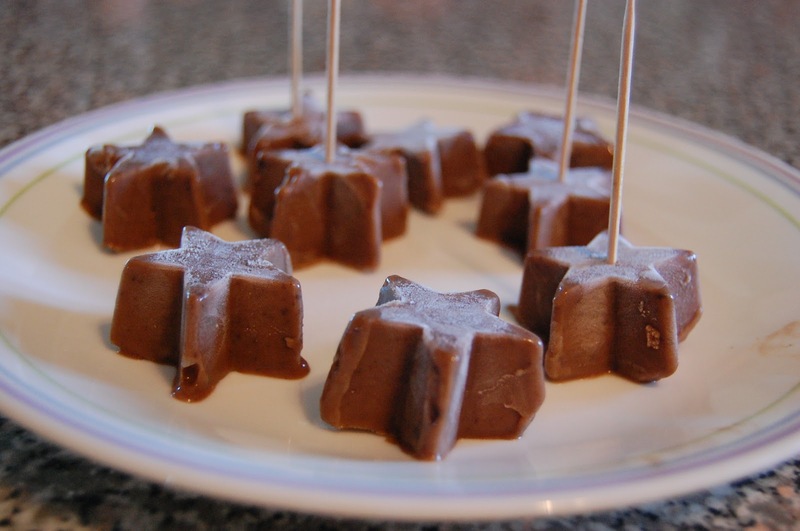 This recipe for Homemade Fudge Pops is also on the Taste of Home website. In a large saucepan, melt butter over medium heat. Stir in flour until smooth; gradually add milk. Stir in the brown sugar, cocoa and salt. Bring to a boil; cook and stir for 2 minutes or until thickened. Remove from the heat; stir in vanilla. Cool for 20 minutes, stirring several times. 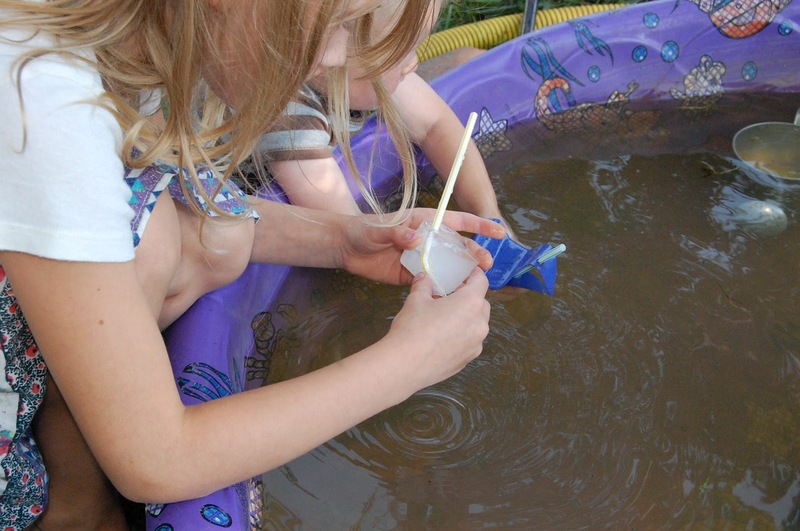 Pour 1/4 cupfuls into Popsicle molds or plastic cups; top molds with holders or insert Popsicle sticks into cups. Freeze until firm. Yield: 20 servings. 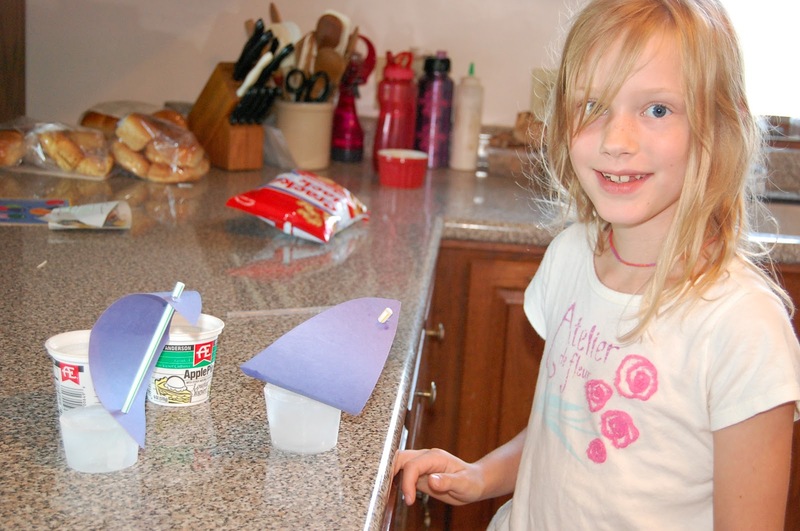 The recipe was simple enough for Brielle, 5, to help extensively with it. We made a few alterations as usual (I can’t seem to follow directions whether it’s intentional like with my recipes or unintentional like with my knitting). I used about 1/3 less sugar, half unsweetened almond milk, and almond extract instead of vanilla. 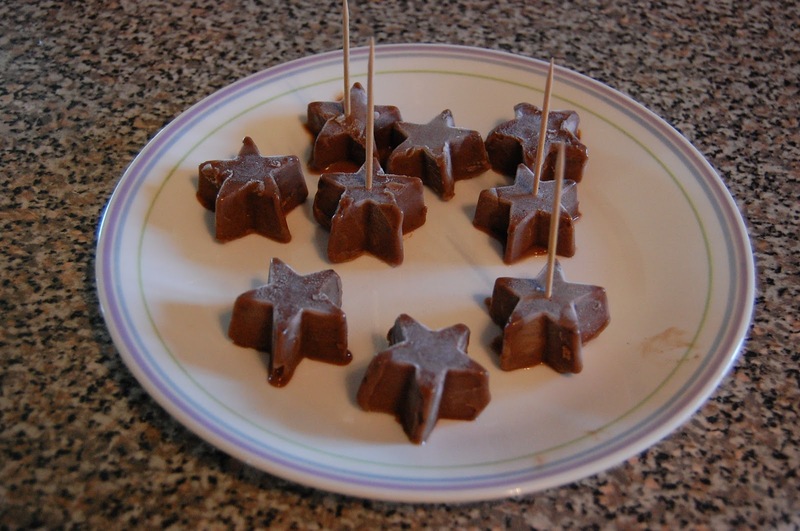 I also used shaped ice cube trays instead of popsicle molds for smaller servings and much less meltage. 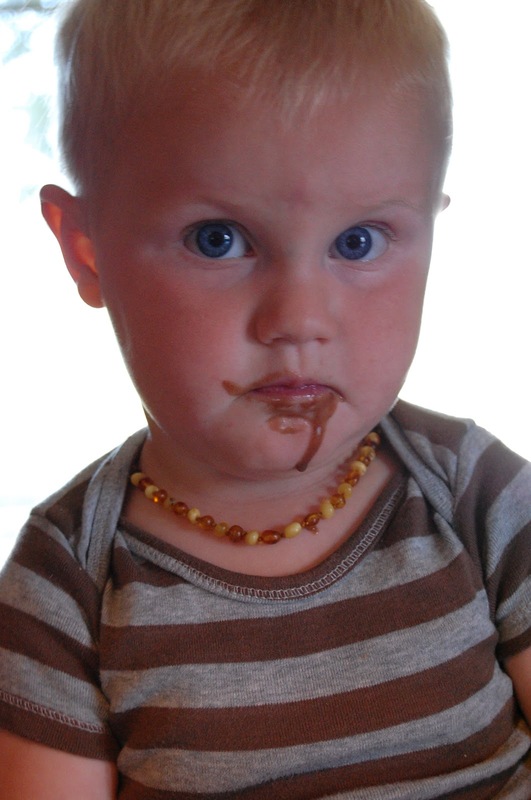 Although, they still manage to get the chocolately deliciousness everywhere. They were cute but didn’t float evenly at all and the sails made better crowns than sails as it turned out. And they only lasted for about a minute. Seriously. It’s hotter than a volcano. I came across a stellar documentary last night. It’s called Fat, Sick and Nearly Dead. It’s about this Australian guy (and that makes it all the better in my humble opinion; I love listening to accents) who was overweight and suffering from a chronic autoimmune disease. He cured his ailments and is LOVING life now because of his change in lifestyle! He juiced fresh fruits and vegetables and that is ALL he consumed for 60 days. His sites have all kind of information about the how and why so I won’t go into that here. 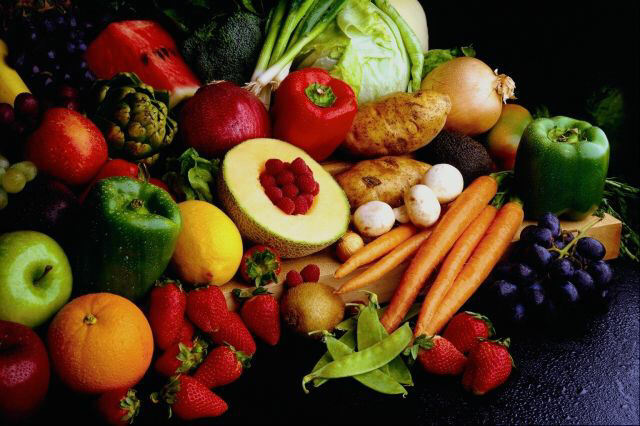 Whether or not you agree with juicing as a method isn’t the point. The fact remains he cured himself with FOOD. What you put into your body matters. The point I’d like to make is the Standard American Diet is NOT good. The food man makes is NOT good. The food GOD made IS very good. My recommendation is that you watch the movie, learn more about traditional nutrition and to the best of your ability, at the very least, quit processed food, food that comes in box. I don’t exclusively make everything we eat, just so you know. I’m in a learning process. Change is challenging. I was so motivated, I made smoothies for breakfast. I don’t have a juicer and I think getting the whole fruit or vegetable is better for you than just the juice anyway. So I threw what I could find in the (very vintage) Vita-mix. It amounted to some carrots, a couple apples, leftover broccoli and cauliflower and peas, a couple bananas, some water and ice. The color was somewhere between tan and orange. Thankfully, it tasted good. To the children, it was a whole ‘nother story. I held my ground though, and wouldn’t let them have anything else until they drank their serving. Aviana and Cadrian eventually did. Brielle and Denton wouldn’t. Brielle said she would if I would put stevia or honey in it, but I was being stubborn. I went to the grocery today to buy a whole bunch more fresh fruits and veggies. I wonder how the battle will go tomorrow. I know in the end it will be the best for them–and that is part of what parenting is all about. Doing what you know is right especially when it’s hard.